This manhole cover on Lyon Street doesn’t look bad, but others are lower in the new pavement and will be brought up to grade. 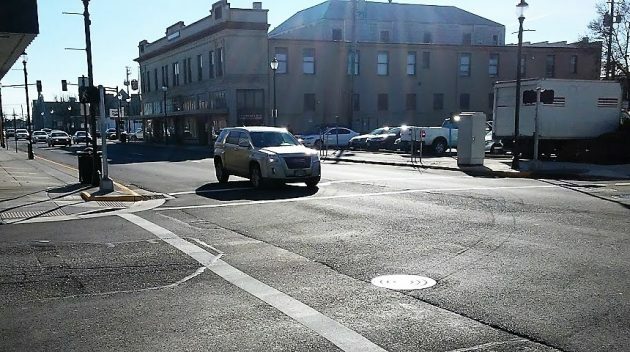 The bumps are where about half a dozen manhole covers and water valve lids were not raised in order to be level with the new layer of asphalt when ODOT resurfaced Lyon and Ellsworth streets downtown in 2018. This has led to a few complaints and questions. Drivers don’t expect potholes in newly paved roads. When I asked ODOT about this last November, a spokesman told me that as far as he could learn, the agency was working on a timeline to get the repairs done. Albany Councilman Bill Coburn brought it up at a council work session Monday. Whatever happened to that project, he wanted to know. Jeff Blaine, in charge of public works engineering and community development, told the council that ODOT didn’t do adjustments of this kind. So no, the state wouldn’t fix the bumps, but the city would step up. There are, Belcastro added, one manhole on Ellsworth and at least six manholes and valve boxes on Lyon Street that will need to be adjusted. This story has been edited to clarify the number of covers to be adjusted. Just another example of the sillyness of our governmental agencies and the ages old game of “hot potato”. What ought to be is that repairs come out of the supervisors paychecks if work is not done at the time of the original work! It would be interesting to know why 18000 one way and only 12000 the other, why those 6000 folks took a different route back the other way. I was wondering that too, I’m guessing where the sensors were placed may explain it? Daily I take 2nd Avenue instead of continuing on Ellsworth to 99 in the mornings and 1st Avenue with a right turn on the Lyons bridge in the evenings. If the sensors were placed before 2nd Avenue on Ellsworth they would count me entering Albany but not leaving Albany unless the sensor was on the Lyons street bridge. I’m certainly not the only one to take these commuter paths. I’ve learned over 14 years of commuting its better for my daily peace of mind to avoid the double left turn lane weirdness and subsequent merging madness by the train station. 2nd and 1st are great alternatives to Ellsworth/Lyons and Hwy 99 route.. Thanks for the comment. One thing. Let’s try to remember that there’s no s at the end of Lyon. Had your story about no “s” on Lyon been posted, I wouldn’t have made this mistake. I’ve honestly never noticed the streets signs even though I’ve driven by them I don’t know how many thousands of times so I’ve never known how it was spelled. It’s continued to be perpetuated in my mind because the only way I can keep Ellsworth straight from Lyon is with the mnemonic (I don’t know if mnemonic is the right word) “lions are leaving”. How will I remember it now if grammatically it can’t be “lion are leaving”? I guess it will have to suffer in my mind like poor Harrison and Van Buren in Corvallis! I’ve yet to find a mind trick to keep those two straight (and if I spelled them wrong, I looked them up on Google Maps so it wasn’t me). P.S. I do feel somewhat redeemed that my suspicion about the discrepancy in traffic volume was correct. It is interesting to know that 6,000 people per day take the same route I do to avoid Lyon. There is one other issue, namely the inherent sexism in the very term, manhole. A more abhorrent moniker does not exist. The City Council, upon which Mr. Kellum is enthroned, would demonstrate true gender leadership by spelling out far less offensive nomenclature for what amounts to a hole in the ground. Sheesh! You might be interested in my previous story on this. Sacramento addressed the nomenclature years ago. As this is a pressing issue with no apparent support from the Council, I would appreciate any supportive information which might allow Albany to move out of the Dark Ages, into the bright progressive light. Not sure what story you are referencing given you didn’t provide a link. But I’ll assume you’re referring to Sacramento’s change to “maintenance hole, or MH”. They did this for practical reasons more than cultural reasons. Their maps designate manholes as MH, so the change doesn’t require an expensive change to the maps. As a transitioning progressive, I think it’s critical that government rids itself of occupational references that are gendered like “manhole.” I mean, women can do the same work down in a MH that a man can do. It’s important for a progressive culture to open up (pun intended) MH’s to women. I hope this post makes sense. I can barely read the notes I took when researching this topic. My penmanship is atrocious. I’m still learning to become woke on gender neutrality. This is such a petty and classless response from a city council member. I expect more respect for your constituents than you’ve shown here. Mr. Kellum, I agree with you. I do not think the city council should be wasting time on discussing renaming manholes. My issue has everything to do with your completely condescending and dismissive tone towards the commenter, as if her opinion didn’t matter. It was rude, petty, and completely disrespectful. You say that “your constituents want you to worry about real problems.” Well, I am one of your constituents, as I assume L. LaRosseau is. We are your constituents regardless of if you agree with us or not. This is me getting involved, sir. I expect my city council members to treat the citizens of this city with respect. I may not be in a position to run for office myself now, but I may be in a position to support someone else who is. I would urge you to apologize to L. LaRosseau, and you would probably be wise to stop encouraging people to run for your seat. You may find someone willing and able to take you up on that offer. Hummmmm Andy, let me be precise………… I am not a doormat…….. give snarky get snarky…. How about “utility access cover”? While we are on that subject – How often do we refer to the person who delivers our mail as the mailman? Wouldn’t “Postal Person” be more appropriate? Here here! The very idea that someone thought it appropriate to name an entrance into Mother Earth a manhole is horrifying. “Postman” became “Letter Carrier” years ago. Guessing there’s a gender-neutral replacement for “manhole”, but my industrial site stayed with the old terms– handhole, manhole, ship oval, hatch, etc. Each had a specific purpose. On another note, I drove both lanes of Ellsworth and Lyon today to test the complaint. I don’t find a significant problem. I suspect that any repair attempt now will only make a small issue large. The high-build markers for lanes, crosswalks, et al cause more cumulative noise; but they are also just fine. November of 1846. His son, Abraham, followed his father’s advice and came to Oregon in 1847 with his good friend John Burkhart to begin settlement of his father’s dream. I have seen “Lyon” spelled with an “s” (“Lyons”), without an “s” (“Lyon”), and even without a “y” (“Lines”). I was always going to research the real story about its origin. Your article above suggests the correct spelling is “Lyon”. Please enlighten me with the source so I may be better informed. I wonder if very old phone books also show changes to spelling ..